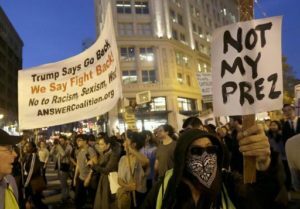 As President Barack Obama and Hillary Clinton called for Americans to support President-elect Donald Trump, George Soros was sending his minions out to protest free and fair elections. “This is a disaster. We fought our hearts out to avert this reality. But now it’s here,” MoveOn.org staff wrote to members. “The new president-elect and many of his most prominent supporters have targeted, demeaned, and threatened millions of us — and millions of our friends, family, and loved ones. Meanwhile, distraught “snowflakes” [defined by Wikipedia as students who seek to avoid emotionally charged topics or dissenting ideas and opinions] on the American University campus burned the American flag to protest Trump’s victory. Young acknowledged that “some people might view” the flag burning as “disrespectful,” but said that it put him at peace.